As part of National Small Business Week in the United States PayPal today announced PayPal Business in a Box aimed at U.S. small business owners who would like to take the leap into online sales. You might be just starting a business for the first time but you don’t have web design capabilities to develop an online store or know how to set up online or point of sale payment methods, or an established offline business looking to move online. FileMaker, WooCommerce and Xero make a great combination when it comes to running your business – we should know as we’ve been using these platforms for many years to manage our business, online store and accounting needs. We’ll be publishing a new article shortly about the benefits of integrating FileMaker with WooCommerce and Xero and how you can save time and money and avoid unnecessary double data entry. WooCommerce 2.7 is getting close to final candidate release – this promises to be a major release with lots of structural changes designed to improve performance. 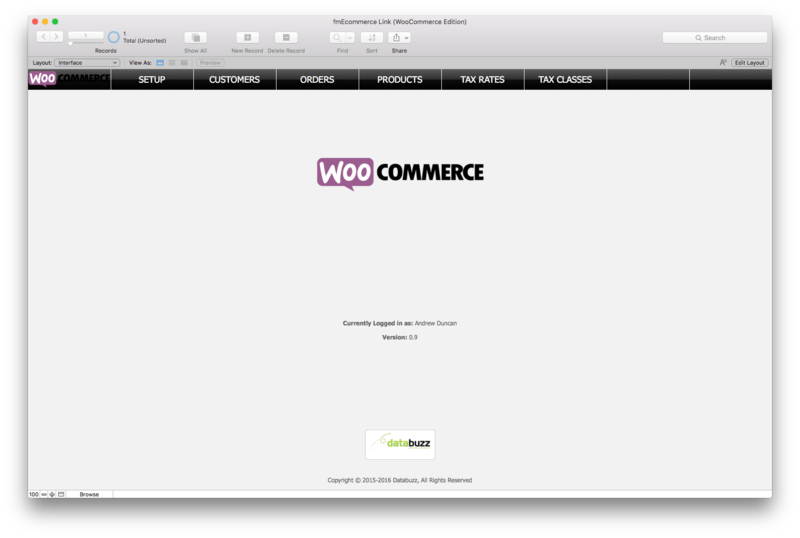 There will also be a number of changes to the WooCommerce REST API that our fmEcommerce Link (WooCommerce Edition) FileMaker solution integrates with. You can read about all the changes in WooCommerce 2.7 on the WooCommerce blog – at this stage it looks like they will introduce a v2 of the REST API and keep the current v1 functionality so products like fmEcommerce Link will continue to work. We’ve reported a number of bugs with v1 of the REST API which will be fixed in the v2 API – we’ll keep monitoring the status of the changes to the REST API and incorporate the changes in the v2 API in a free update to fmEcommerce Link for all our existing customers. There will be a number of changes to the REST API endpoints with the WooCommerce 2.7 release so we’ll need to make some associated changes and do a lot of testing to make sure all the existing functionality continues to work. Most of the changes related to Products and Variations which are the most complex endpoints to integrate with, so we’re looking forward to a more simplified way of creating and updating Product Variations. The updated version of fmEcommerce Link will then only support WooCommerce 2.7 or later going forward (v2 of the REST API) – we’ll let everyone know when the new version is available once we’ve completed our development and testing. We’ve just released our first update to fmEcommerce Link (WooCommerce Edition) for 2017 – this release provides an alternative method for handling authentication for some servers that may not parse the Authorization header correctly, as well as making the process of working with Product Variations much easier. "message": "Sorry, you cannot list resources." This is a free update to all our existing customers – we have a number of items on the list to add, including Refunds (create a Refund in FileMaker and upload to WooCommerce) and download Reviews. If there’s any examples that we don’t currently have that you would like to see please get in touch and let us know. 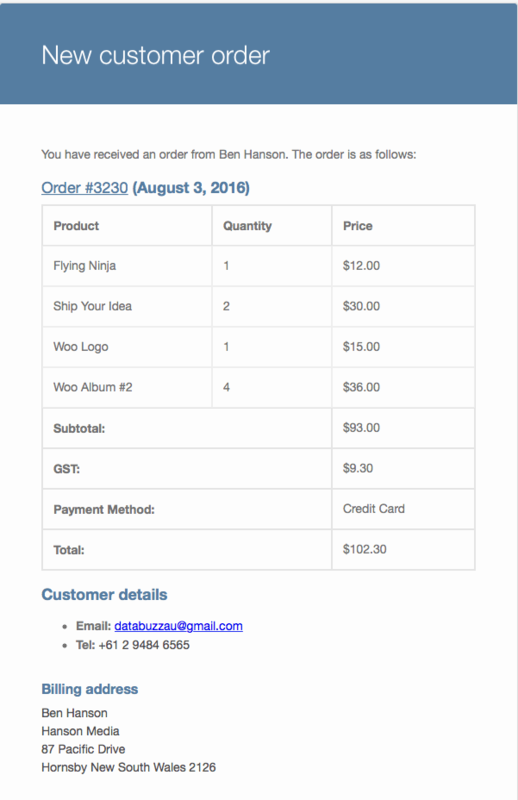 When we released fmEcommerce Link (WooCommerce Edition) last week there was one feature that we wanted to include that wasn’t quite ready: Order Webhooks. The initial release of fmEcommerce Link lets you download orders from WooCommerce, either all at once or within a specified date range. For many users that will be sufficient as they might only need to download all orders from the previous day. Some customers would prefer to be notified immediately the order was placed and have it automatically download into FileMaker – you could setup a server side schedule that ran every x minutes that checked for new orders since a specified timestamp, but it’s much more efficient to leverage Webhooks if they are available. A Webhook is simply a way of having WooCommerce send a notification to another service at a nominated URL when a particular event is triggered. 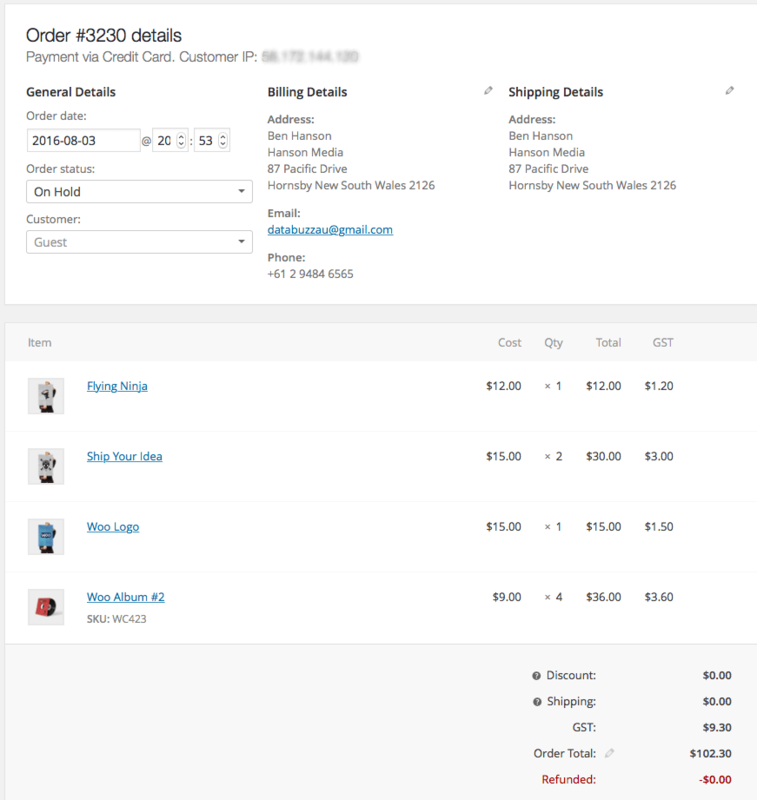 Webhooks were introduced in WooCommerce 2.2 and can trigger events each time you add, edit or delete orders, products, coupons or customers. New orders seemed the logical place to start – wouldn’t it be great if upon receiving a new order in WooCommerce it could be pushed to the fmAccounting Link FileMaker file automatically without you having to do anything? We’ll be releasing a free update to fmEcommerce Link (WooCommerce Edition) in the next couple of days which will include support for Webhooks when a new Order is created. You will need to setup a Webhook and install the supplied PHP file on your FileMaker Server (you will need to enable Custom Web Publishing/PHP in your FileMaker Server Admin Console), and once this in place anytime a new Order is received in WooCommerce it will automatically be pushed to the fmEcommerce Link file, typically within a few seconds. 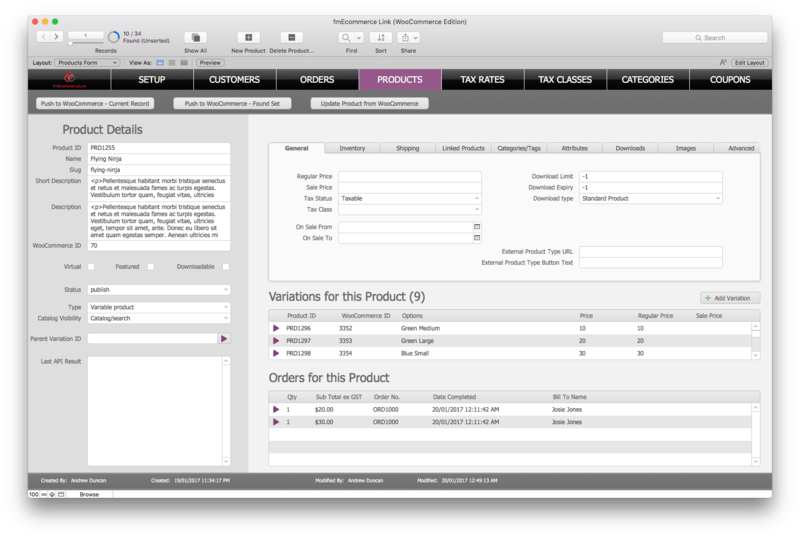 Earlier this year we published a series of articles about FileMaker and eCommerce Integration, highlighting our use of External SQL Data Sources (ESS) to make our online store orders visible in our internal FileMaker CRM. We’ve been using this method of integration successfully for many years and it has saved us countless hours by not having to manually re-enter online orders in our main FileMaker business app and our accounting software (Xero). Suddenly we could no longer see our online order records! Everything was still working on the website and orders were still being submitted successfully (we receive an email for each order) so we started troubleshooting this to try and get to the bottom of it. After many frustrating hours we still could not establish the ODBC connection to our server, so we made contact with our web host and opened a ticket explaining our issue and describing how this had previously worked fine for many years. We were then informed that they had disabled remote MySQL access for security reasons and there were no exceptions – talk about a great way to annoy your customers by switching off access and not informing your customers about this! It was still possible to connect but you had to create an SSH tunnel first – we then wasted another couple of days setting up the SSH tunnel which would work but then drop out, and we had issues with automating this so it could run when the server wasn’t logged in. After many days of frustration and lost productivity I decided to abandon the SSH tunnel efforts as it was proving too unreliable and too look at other options. Databuzz specialises in FileMaker integration and having recently written an article on working with eCommerce APIs and Webhooks I revisited my article and knew what needed to be done. Our website stores are built with WooCommerce, a popular plugin for WordPress that powers over 39% of all online stores. WooCommerce offer both a push and pull API so you can have new orders automatically pushed to a server, and also download new orders on demand (e.g. get all new Orders today). The push option is the more complicated of the two options as it requires FileMaker Server, Customer Web Publishing, PHP pages and Webhooks to be setup, so we decided to focus initially on the WooCommerce REST API as that allows us to query WooCommerce for any new Orders and download the data directly into FileMaker. This can be run regardless of whether the file is hosted with FileMaker Server or just using FileMaker Pro, and we can also setup server side schedules to run each night and download new data. The REST API also allows us to push data from FileMaker to WooCommerce, such as Product updates, which is something customers have requested in the past. fmEcommerce Link is our solution to connecting FileMaker to WooCommerce when you can’t make a direct ESS/ODBC connection – you use the fmEcommerce Link file to query your WooCommerce store for new orders, product inventory changes, new customers and also to push data back to WooCommerce such as new Products. You can link the fmEcommerce Link file to your existing FileMaker solution to push orders from WooCommerce into your main FileMaker business app, or recreate the same functionality inside your FileMaker business app as the fmEcommerce Link will be 100% unlocked for you to explore. I’ll be posting some videos demonstrating the core functionality of fmEcommerce Link over the coming days and would love to hear any feedback from existing FileMaker/WooCommerce users about any features you would like to see in the product – just leave a comment below. Recently we wrote an article about the benefits of automating the processing of credit card payments using your FileMaker solution and why you shouldn’t be storing unencrypted credit card numbers in your FileMaker database. We wanted to demonstrate how easy it is to tokenise a credit card number and then charge that token when processing a transaction so we put together a short video demonstrating this. We’re using the eWay Payment Gateway in this example. You can watch the video below or directly on YouTube via this link. Are you still processing credit card payments manually? Do you process credit card transactions manually and wonder if there is a better way? The good news is that there is a better more automated way that can integrate with your custom FileMaker solution and save your staff time and your business money. Chances are if you’re a small business that sells goods or services your customers are going to want to pay by credit card, and having options and making it easy for customers to pay your invoices is a good thing for your business. 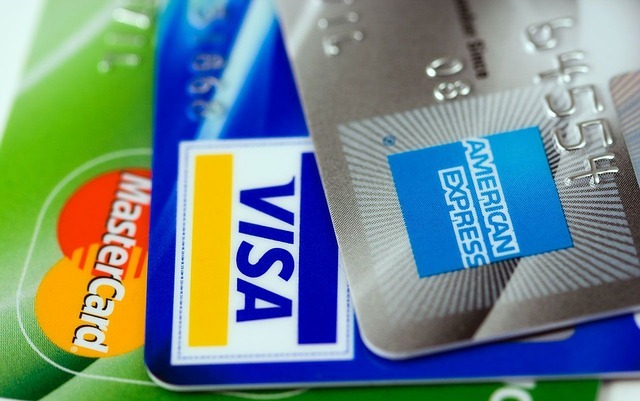 Once you start accepting credit card payments however you need to comply with the PCI DSS (Payment Card Industry Data Security Standard) to help protect card data and prevent payment data theft. Small businesses are increasingly at risk for payment data theft – nearly half of cyberattacks worldwide in 2015 were against businesses with less than 250 workers according to cybersecurity firm Symantec. This can all be automated in a FileMaker solution allowing staff to process a payment or tokenise a card at the click of a button. We’ve worked with many PCI DSS compliant credit card gateways such as Stripe, eWay, BPOINT and Authorize.Net to help customers automate the process of processing credit card payments securely in their FileMaker solutions. If you’re currently storing credit card numbers in your FileMaker solution and would like to tokenise these we can also help you batch process these. Update: we’ve published a short video demonstrating how you can use FileMaker to tokenise a credit card and then process a transaction by referencing that token. https://www.databuzz.com.au/wp-content/uploads/2014/07/databuzz-logo-small-300x88.png 0 0 Andrew Duncan https://www.databuzz.com.au/wp-content/uploads/2014/07/databuzz-logo-small-300x88.png Andrew Duncan2016-10-11 09:31:382016-11-11 21:03:46Are you still processing credit card payments manually? In Part 1 of our series on FileMaker and eCommerce Integration we outlined the challenges many small businesses face when they go live with an online store and the new workflow challenges that can create, leading to the prospect of having to do double data entry in multiple places. In Part 2 we showed how you eliminate any double data entry by making your online store visible to your FileMaker solution by using the ESS (External SQL Data Sources) feature of FileMaker Pro/Server, allowing users to see online orders on a normal FileMaker layout. There are a number of alternatives to having a “live” view of your online orders using ESS which can be broadly defined as either a push or pull approach, whereby data is either pushed from the online store to your FileMaker solution or pulled/downloaded from your online store by your FileMaker solution. Like all solutions there are pros and cons to each approach and the particulars of how your FileMaker solution is hosted will determine which options are available to you. In the following examples we’re going to be using the WooCommerce plugin for WordPress as it offers both a push and pull API and is a popular eCommerce store, powering over 37% of all online stores at the time of writing. Push Online Orders to FileMaker – the push approach is usually considered the most optimal solution as it is only invoked when there is new data to transfer, thus reducing the number of unnecessary requests to the online store to check for new orders. In WooCommerce you implement a push solution through the use of Webhooks – Webhooks are are very common form of server event notifications which trigger an action by sending a request to a URL that you specify. 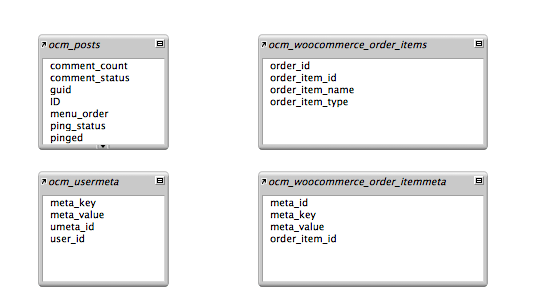 WooCommerce has a number of Webhooks that you can activate, for example each time a new order is created. 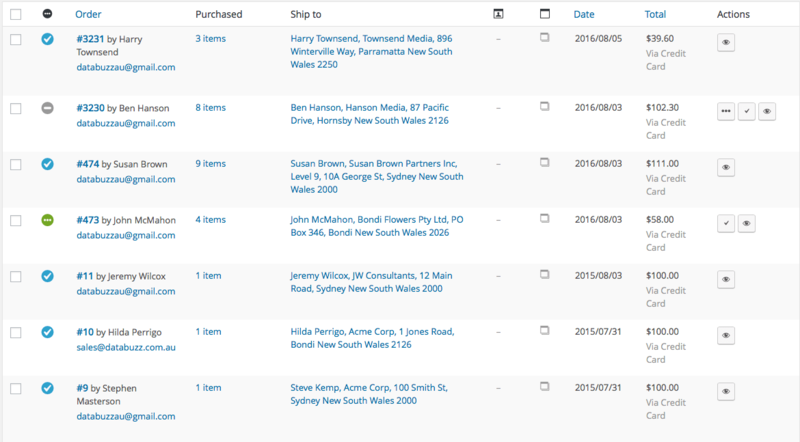 The customer also receives an email for each new order, which prompts them to open their FileMaker database and review the order details and ship any required products then push the invoice to their accounting software (Xero, MYOB etc). The customer hasn’t had to do any double data entry or query the online store for new orders – everything is pushed through as it happens. It does require the customer to have FileMaker Server with Custom Web Publishing enabled and allow external access to the PHP file hosted on their server. Once again the customer has been able to eliminate any double data entry and simply has to click a button in FileMaker to get all the new order details. As we have illustrated in this series there are typically a number of options available when it comes to integrating your online store with your FileMaker CRM, whether that’s a direct live view using ESS or having new orders pushed or pulled into your FileMaker solution. With an integration into your accounting software such as Xero, MYOB AccountRight or MYOB Essentials you can completely eliminate any double data entry for the entire order and sit back and watch as the data flows from your online store to FileMaker and then to your accounting software. If you would like to discuss integrating your online store with your FileMaker CRM please get in touch for a free initial consultation. In Part 1 of our series on FileMaker and eCommerce integration we outlined the challenges many small businesses face when they go live with an online store and the new workflow challenges that can create, leading to the prospect of having to do double data entry in multiple places. So we now currently have 2 online stores located at different domains, but we will eventually merge these together to simplify things. As both stores were built using the WooCommerce plugin for WordPress and hosted with the same web hosting provider, we knew that any integration solution for one of the stores would work for both stores. We would then have to copy and paste all the details into our FileMaker CRM, push the Invoice to Xero using our fmAccounting Link (Xero Edition) integration, then add the customer to the appropriate mailing list in in our MailChimp account. When you’re only dealing with a couple of orders a month you can probably cope with doing things manually, but once you start to get several orders a day you are then impacted by the time it takes to do all of these takes which are also prone to data entry errors. Like us you probably start wondering if there is a better way and can this process be automated. 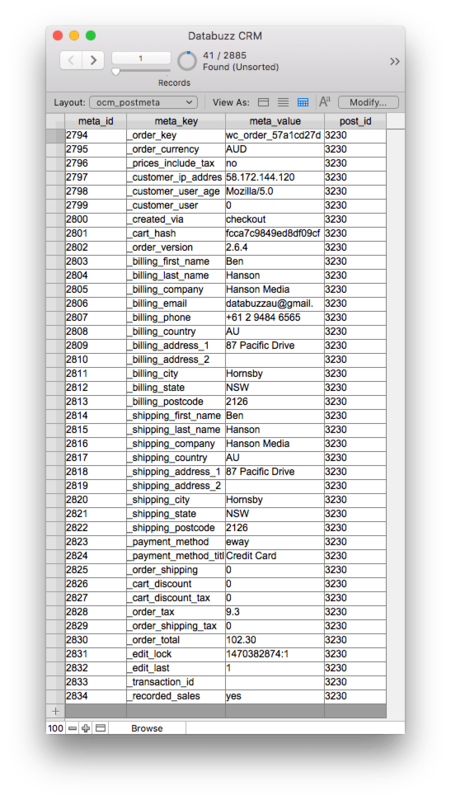 These are also supported ESS data sources so you can use the ESS feature to get your FileMaker CRM talking to your online store. 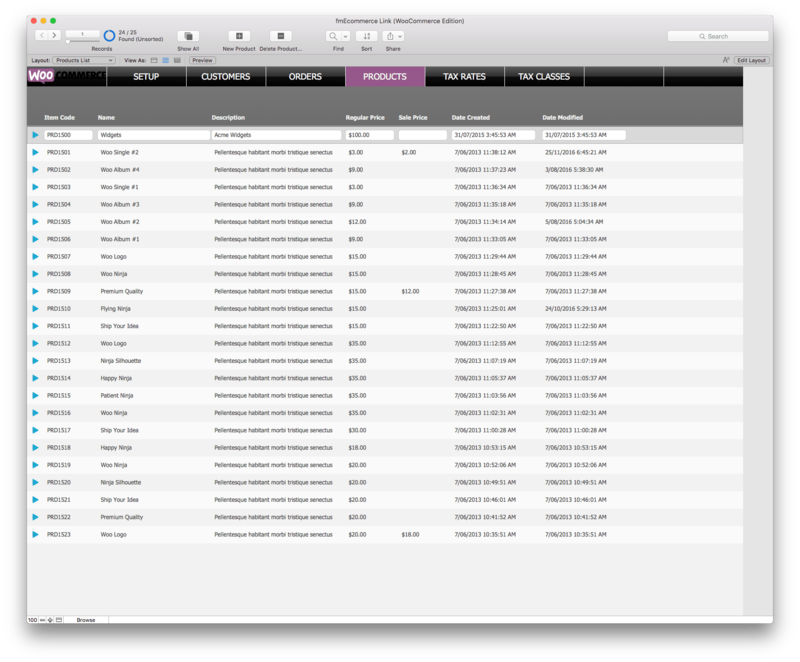 ESS allows you to view your SQL data from within FileMaker – it appears just like normal FileMaker tables. You can create new layouts to view the data, create relationships from your FileMaker tables to your ESS tables, access the SQL data from FileMaker scripts and more (there are some limitations and it does require setting up ODBC drivers – see the Accessing External SQL Data Sources (ESS) Overview and Troubleshooting for more details. 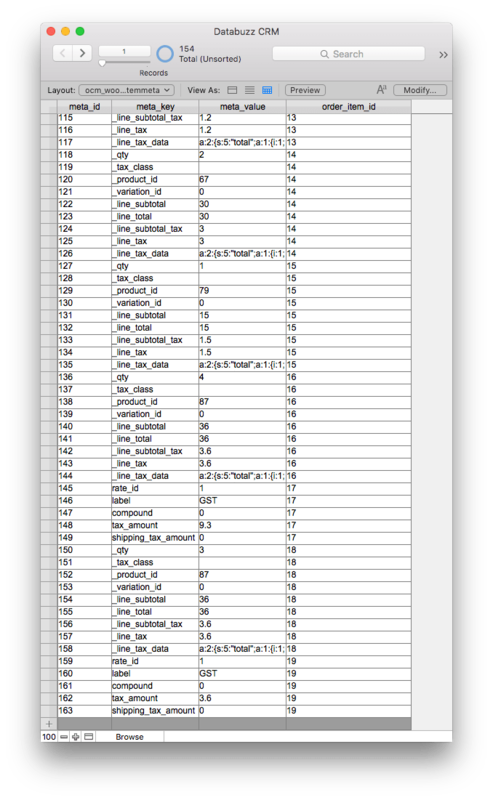 As you can see by looking at these ESS tables in FileMaker we can see all the data about each order but it is located in at least 4 different tables, making aggregating the details each order so we can easily view the complete order challenging. We could create a number of FileMaker calculation fields to extra details about each order based on the meta_key for Orders and Order Line Items, but that would end up adding a lot of table occurrences and relationships to the graph and create another layout of unnecessary complexity. We now have a FileMaker layout showing all the details for a single WooCommerce/online order, including Customer Details, Line Item Details and related Product Details. From here’s a simple case of FileMaker scripting to move the data from the ESS tables to the native FileMaker tables (first checking for any existing Customers with the same name) and from there into Xero. 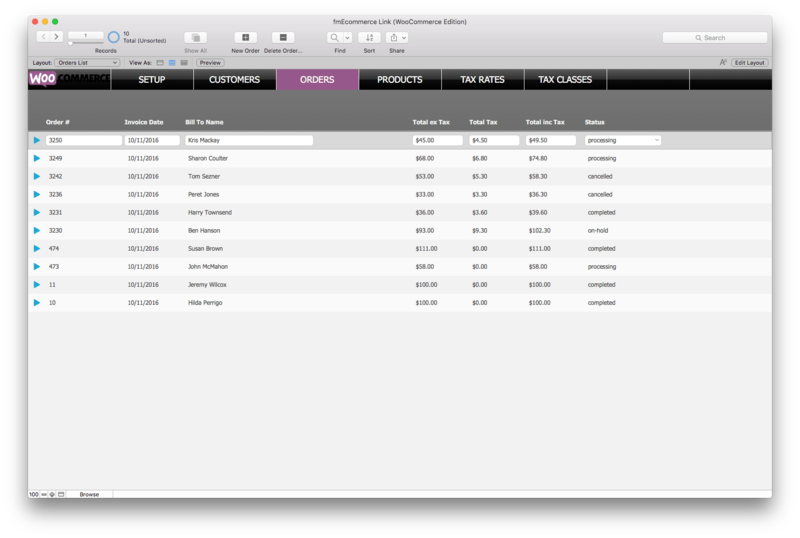 We add a button to the Online Order layout to push the online order into out FileMaker CRM which handles all of these tasks, saving us around 15 minutes per online order (we have customers that are getting tens of orders every day so they time savings really start to add up). if you’re accessing a MySQL data source you will typically have to setup Remote Access to the MySQL database via your web hosting company (e.g. via cPanel). 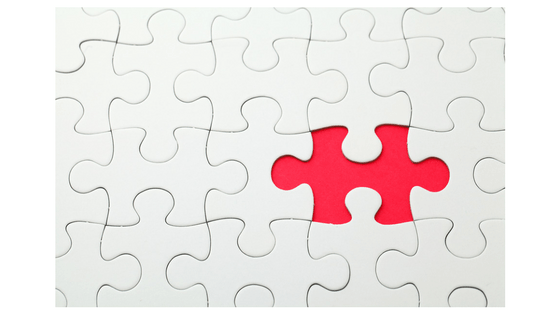 In Part 3 of this series we’ll look into the options when you can’t use ESS and how you can still go about integrating your online shop with your FileMaker CRM. In the meantime if you would like to discuss integrating your online store with your FileMaker CRM please contact us. 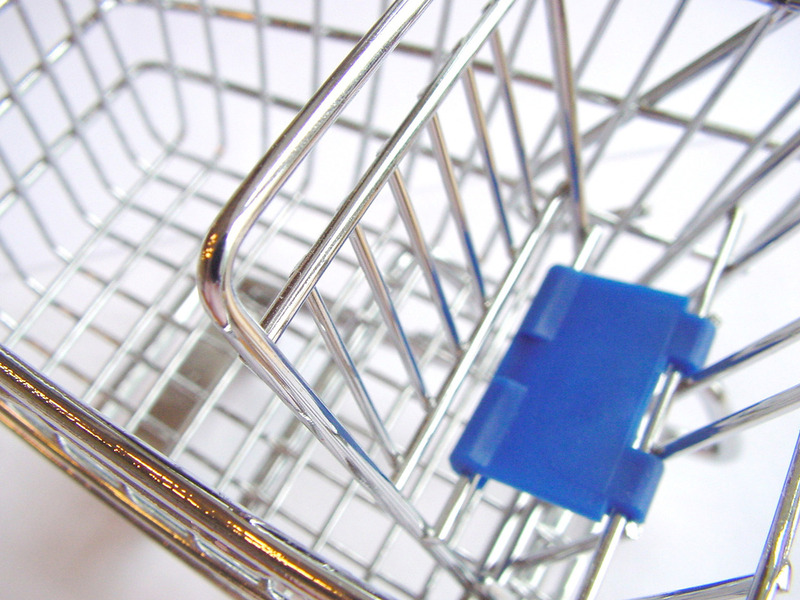 online/eCommerce orders are processed via the online store attached to the customer’s website. The business is notified of new orders via email and these are then entered into the central office CRM system by customer service staff who then notify the accounts department to create an accounting entry in Xero or MYOB etc. We wouldn’t generally recommend to customer’s that they use FileMaker to run their online eCommerce store, so there’s no problem with having the physical presence and the online presence separate (and it’s highly advisable from a security standpoint). 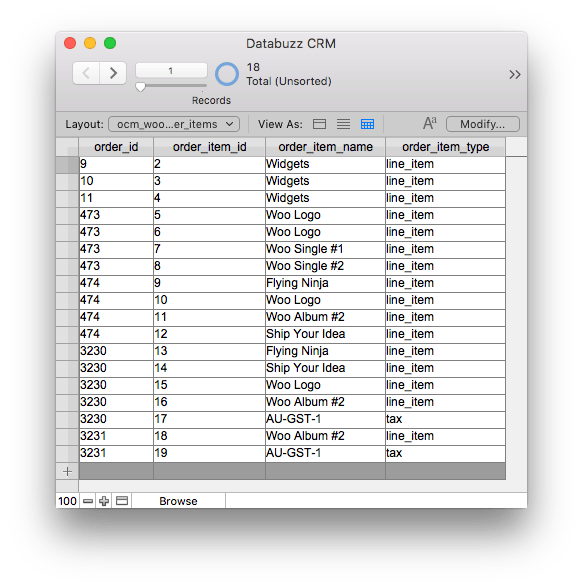 However this leads to the problem of scattered information and ad hoc processes – wouldn’t it be better if all the information was in one place and you could see all the physical orders and online orders from the central FileMaker CRM? 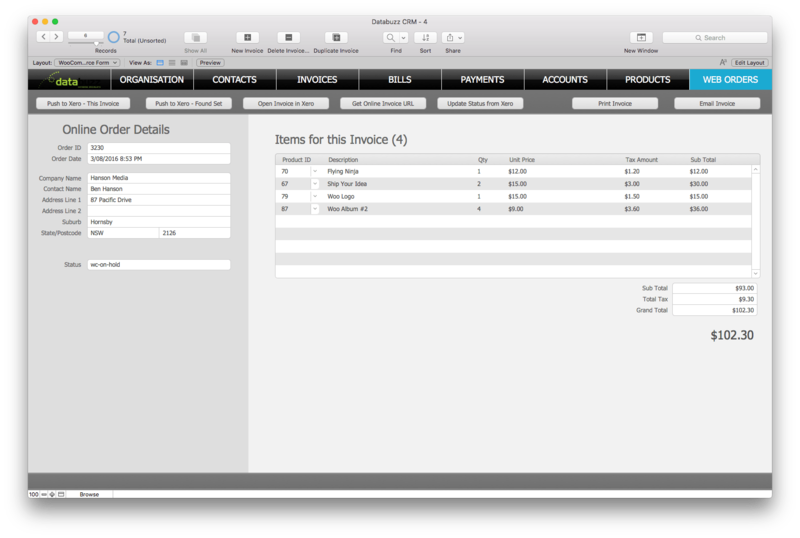 Could you save time and increase productivity by not having to manually re-enter all the online orders in both the main FileMaker CRM as well as your accounting software? We’ve been helping customers for many years now integrate their online stores with their FileMaker CRM solution so they can view everything in the one place and automate the transfer of online orders into their office CRM, and then push that into their accounting software without having to re-type anything. Here at Databuzz we recently faced the same challenges that we’ve been helping our customers with for many years – we opened our first online store last year and have been working on integrating this with our internal FileMaker CRM every since. In Part 2 and 3 of this series we’ll cover some approaches to eCommerce and FileMaker integration based on our experiences as a small business that uses FileMaker and Xero to run their business.